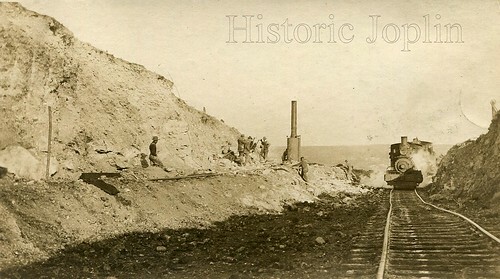 The Missouri-Kansas-Texas Railroad, commonly known as the “Katy,” was building a line through northwest Joplin. 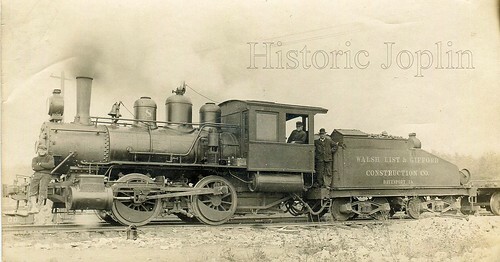 The Walsh-List-Gifford Construction Company of Davenport, Iowa, was responsible for the completion of the new line. The company had previously been engaged in Stillwater, Minnesota, after completing a railroad grading project. One hundred and twenty-five men were employed, most of whom were Belgians. They were required to work ten hours a day, seven days a week. Very few of the men had their wives with them, save for William M. List, who was head of the outfit. If Mrs. List had any objections to the way her husband talked to his work crew, the reporter did not notice. She traveled with her husband on his work assignments, although they had a home in Davenport, Iowa. The Lists were joined by John O’Callahan, superintendent; J.J. Hallett, engineer; and C.H. Swartz, stenographer. F.C Ringer of Parsons, Kansas, oversaw the operation of the steam shovel, F.R. 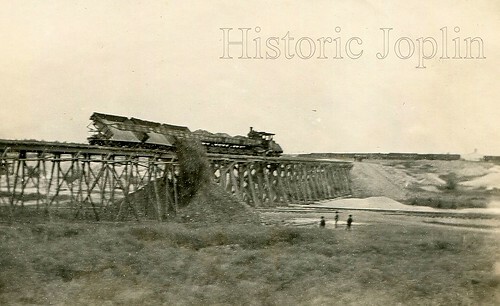 Johnson served as trestle foreman, Leo Purcell was the official timekeeper, and D. Degal was dump foreman. To carry out their work, workers had break the ground using power and dynamite. The drill rigs were used to bore holes into the roadbed to ensure the ground was soft enough. Some of the drill holes ranged from five to thirty feet deep in places. When the holes were finished, they were “squibbed,” which meant that light blasts of powder were placed in the holes to open up the ground even further. After setting off the light blasts, large kegs of black powder and entire cases of dynamite were placed into the holes and set off. After the ground was properly softened up, the seventy ton steam shovel was brought in to scoop up rocks and dirt at four scoops a minute. 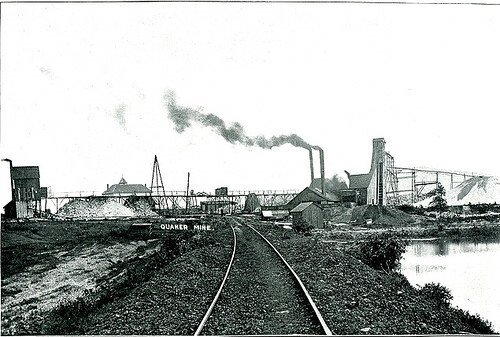 It was estimated that the steam shovel could remove 2,500 cubic yards of dirt in a day. The shovel would then dump the dirt and rocks into cars situated on a sidetrack built alongside what would become the main rail line. When the cars were filled, they were pushed by a locomotive to a spot where spots needed to be filled in with dirt. The spreader would then be brought in to smooth the dirt in place. The crew estimated that the project would be completed by January, 1911. After that, their next assignment was unknown, but they could expect to travel anywhere from Maine to California.